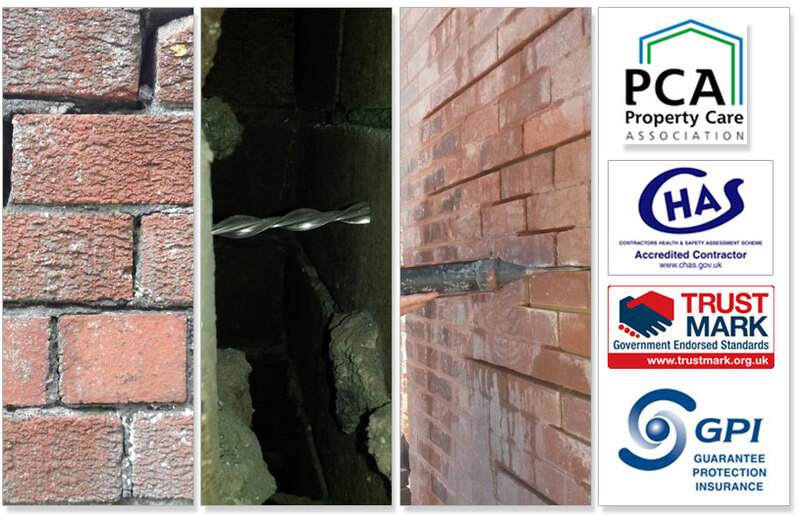 The principal of cavity wall construction is simple and effective, the separate outer and inner layers of brickwork are held rigidly together with steel bars or straps called metal wall ties. Cavity walls have been used for nearly a hundred years, providing a rigid and well ventilated framework with a dry inner surface. So what goes wrong ? Several things can occur the two most common cavity wall tie problems are, cavity wall tie corrosion and cavity wall tie failure. Wall tie corrosion is the term used when the metal ties that bond the inner and outer leaves of masonry or brickwork together corrode or rust due to lack of protection or the breakdown of the original protective layer. Cavity wall tie failure is when the corroded wall ties are no longer adding structural strength as a result the property is at risk of serious damage. What are Cavity Wall Tie problems? The 'tell tale' signs of wall tie corrosion or failure, horizontal cracking at regular intervals, outward bulging of the brickwork, the lifting of the wall and roof edges and internal cracks appearing. With the aid of modern technology and building techniques wall tie problems can be easily rectified. Our wall tie surveyors all hold a National Qualification for remedial surveying (C.S.R.T.) they will conduct an inspection of your cavity walls using an endoscope to determine the condition of wall ties and the extent of any corrosion. On completion of the survey you will be provided with a detailed report that will outline the extent of the damage, with recommendations and a cost breakdown for any remedial work that may be required. All our treatments are supported by insurance backed guarantees, so you can be assured that when we leave, so do any wall tie problems you had. If you have any questions to put to our Wall Tie Survey and replacement specialist or would simply like to book an appointment for a survey please call we are always happy to help.